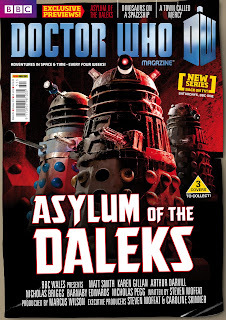 ASYLUM OF THE DALEKS – DWM takes over the Asylum for Doctor Who's most ambitious episode yet. Matt Smith shares his thoughts on the Doctor’s arch enemies, Steven Moffat on the challenges of keeping the Daleks fresh and how Karen Gillan and Arthur Darvill feel about the beginning of the end for Amy and Rory. 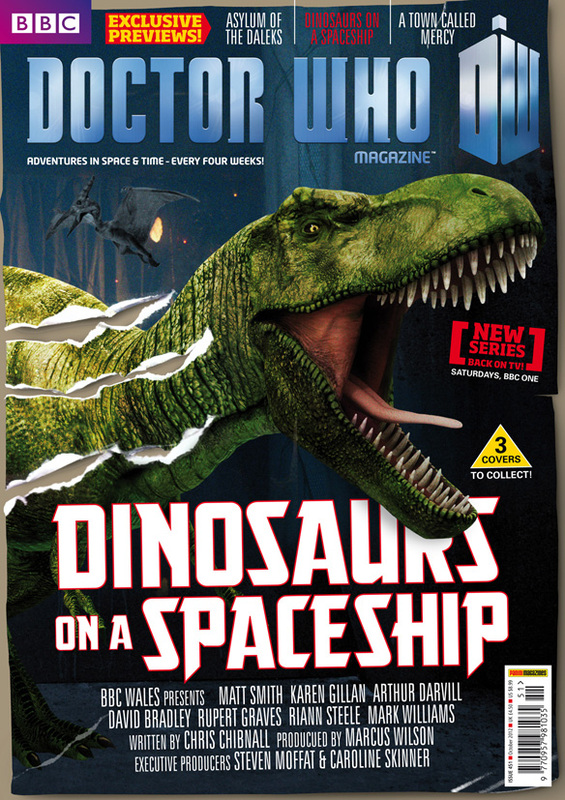 DINOSAURS ON A SPACESHIP – it’s an episode of Doctor Who packed to the rafters with dinosaurs. On a spaceship! 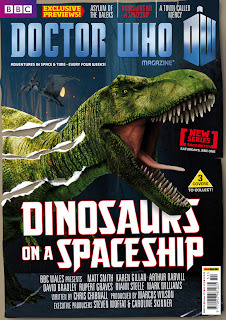 Writer Chris Chibnall reveals how his script lived up to that title, and what challenges did the FX team face on bringing so many dinosaurs to life? A TOWN CALLED MERCY – guest stars Adrian Scarborough and Ben Browder on how thrilled they were to join Doctor Who for an adventure into the Wild West, how the crew enjoyed their time on location in sunny Spain, and what writer Toby Whithouse thought of being out of his comfort zone. THE USUAL SUSPECTS – the writers of the new series are given the once over by Doctor Who’s executive producer, Steven Moffat (including himself!) in a curtain-raising Production Notes. GUILTY AS CHARGED? – John Nathan-Turner was Doctor Who’s most colourful and controversial producer, guiding the show to dizzying heights, but perhaps a few lows too. Luminaries and experts from Doctor Who past and present assemble for the first in a two-part feature to assess the work of the series’ longest-serving producer in The Trial of John Nathan-Turner. COLD FRONT – the Doctor, Amy and Rory arrive in Prague in the dying days of the Cold War. Revolution is on the horizon, but the Doctor senses something unreal in the air. What is the significance of the book The Sorrows of Prague, and why will Yuri Azarov and his terrifying companion stop at nothing to retrieve it? Part One of The Broken Man, the latest comic strip written by Scott Gray with art from Martin Geraghty. IS THIS DEATH? – companions come and go, but should they ever die? Johnny Candon and Toby Hadoke weigh up the pros and cons of crash-landing to Earth in an out-of-control freighter, or heading off into the sunset to marry Brian Blessed in A Battle of Wits. 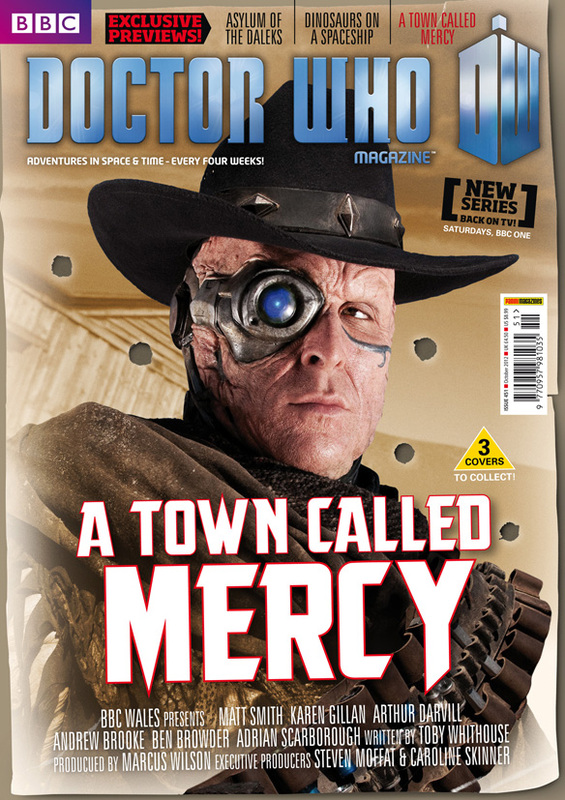 TAKE ART – DWM’s intrepid Time Team – Chris, Emma, Michael and Will – go for gold as the Doctor and Rose land in an ordinary housing estate where extraordinary things are happening as children are going missing, trapped in the drawings of Chloe Webber. Will the Doctor make it to the opening ceremony of the 2012 Olympics as The Time Team views Fear Her? COMING OF AGE ­– Doctor Who’s 21st year saw a season packed with exciting cliff-hangers, companion departures, a tour de force performance from the leading man, andarguably the finest Doctor Who story ever made. Countdown to 50 reaches 1984 and Series 21. ALL IN THE MIND – mind-sucking alien parasites, prison riots, a nerve-gas missile and the Master at his most scheming – find out how the Third Doctor, Jo and UNIT fought The Mind of Evil in this month’s Fact of Fiction. LIGHT MY FIRE – the Watcher warns of the pitfalls of predicting the near future as A History of Doctor Who in 100 Objects reaches number 22 – the Olympic Torch. Was the 2012 of Fear Her remotely like the real thing? Also stare into the eyes of The Six Faces of Delusion, flick through The Stockbridge English Dictionary and marvel at the Supporting Artist of the Month in Wotcha! 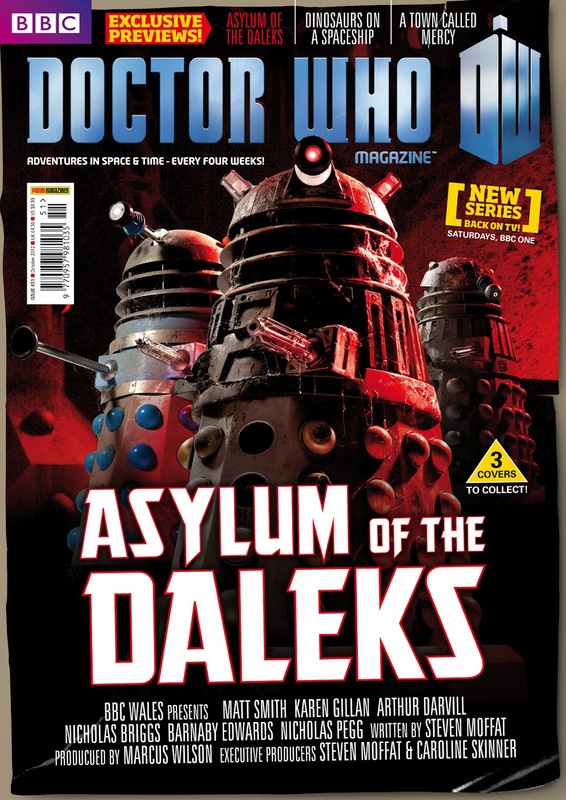 With a choice of THREE different covers, DWM 451 is on sale from Thursday 30 August, priced ￡4.50.